The BBC has seen a leaked document that outlines the road maintenance and repairs that will not take place because of budget cuts. 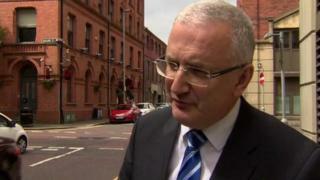 Transport NI is in charge of the work, and have had their budget cut from around £40m to £12.8m. The document, circulated among senior managers and seen by The BBC's Nolan Show, outlines how they are going to cope with the limited amount of money for day-to-day maintenance spend. They say grass verges will only be cut once a year. Gullies will only be cleared when a problem is reported. No more maintenance will be carried out on motorway bridges, and if a problem occurs then the road will simply be closed. No extra money has been earmarked for winter maintenance. They say no-one will be looking out for broken street lights, and defects on rural roads won't even be reported. Regional Development Minister Danny Kennedy said they had to prioritise road defects, and that meant roads with more traffic "will obviously receive greater priority". He explained that Transport NI have taken the brunt of the cuts within DRD to preserve essential services like NI Water, but it is not a decision he wants to take. "We need to address the situation, but the best way is to sort this out at the Executive to deal with the issues that are complicating things about welfare reform that is costing the Executive £2m," he said. "£2m would go a long way in addressing the problems that confront me at the moment." The letter explains that the cuts mean 500 staff will have to stay in depots because there is not enough money for fuel, equipment, or maintenance of vehicles. The minister says that is not the case at the moment, but Gareth Scott from the trade union Unite says restrictions are already in place. "An example would be fuel," he said. "It has now been rationed to 35 litres per vehicle, per depot, per week. "Once that runs out, the vehicle has been parked up until the following week until the next ration comes. That's ridiculous for a Western country." Another monitoring round is taking place within the next few weeks. The minister is bidding for more money for his department at that stage. However, the impact of the cuts is already being felt on the roads, the verges, and the pavements. Phantom budgets and Control Totals: What now for Stormont budget crisis?